The historic downtown district is recognized as a National Historic Landmark for its outstanding collection of 19th century architecture. The Strand anchors the downtown district and is the heart of a vibrant downtown offering waterfront dining, shopping, museums, entertainment, and nightlife. 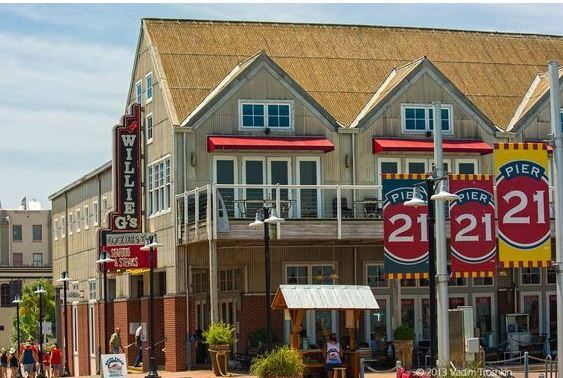 Pier 21 is nestled along Galveston Harbor and offers waterfront views, delicious dining options and a cluster of attractions that showcase the island’s cultural and maritime heritage. Pier 21 is located steps away from the Galveston Cruise Terminal. The Strand located in Galveston’s Historic Downtown draws visitors to its diverse collection of boutiques, gift shops, restaurants and attractions. LaKing’s Confectionary, a old-fashioned candy shop is located here as well as the Galveston Railroad. The Strand and its surrounding streets serve as a hub for activities and entertainment. Marked by its beautiful Victorian architecture and colorfully painted storefronts, the Postoffice Street area is full of charm, offering an enchanting blend of art galleries, boutiques, antique shops, chic eateries and lively entertainment, including The Grand 1894 Opera House. Its artsy atmosphere has made this area a fresh hangout for locals and the center of the island’s popular ArtWalk held every six weeks. This expanding area west of the downtown district boasts old-fashioned, fabled establishments with lots of room for new tenants. Area anchors include Maceo Spice and Import Company, where visitors can sit at a community table for a new experience every day; cocktail speakeasy Daiquiri Time Out, which features fresh, classic cocktails in a sleek, urban setting; and free-flowing Gypsy Joynt, offering eclectic fare locals crave and evening entertainment.